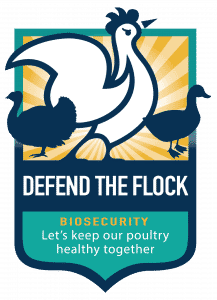 USA - The “Defend the Flock” campaign to promote biosecurity combines and updates two previous campaigns that were each targeted at a specific segment of the poultry population. The US Department of Agriculture’s (USDA) Animal and Plant Health Inspection Service has launched a new outreach campaign focused on preventing the spread of infectious poultry diseases in both commercial and backyard poultry. Considering the devastating impact of the highly pathogenic avian influenza outbreak in 2014-2015, as well as the recent outbreak of virulent Newcastle disease, the timing is right for everyone in the poultry community to work together to protect the health of our nation’s flocks. “While each of the previous campaigns were successful, by combining them and emphasising shared responsibility, USDA will improve its ability to promote biosecurity and protect avian health across the country,” said Dr. Jack Shere, USDA’s Chief Veterinary Officer and a poultry veterinarian himself.